Bernard Zell Anshe Emet Day School prides itself in celebrating curiosity, creativity, and innovation. ESA partnered with educational design consultant Wonder by Design to create a classroom that challenges students and teachers to celebrate collaborative and innovative learning. Unique architectural features, include a reading cave, writable wall surfaces, a living wall, and a custom designed collaborative learning table – the “Big Amoeba.” Educational technology is heavily leveraged and includes multi-surface projectors, a 3 dimensional digitizer and printer, and interactive Apple TV’s allow students to quickly display images, and media from personal iPADS. 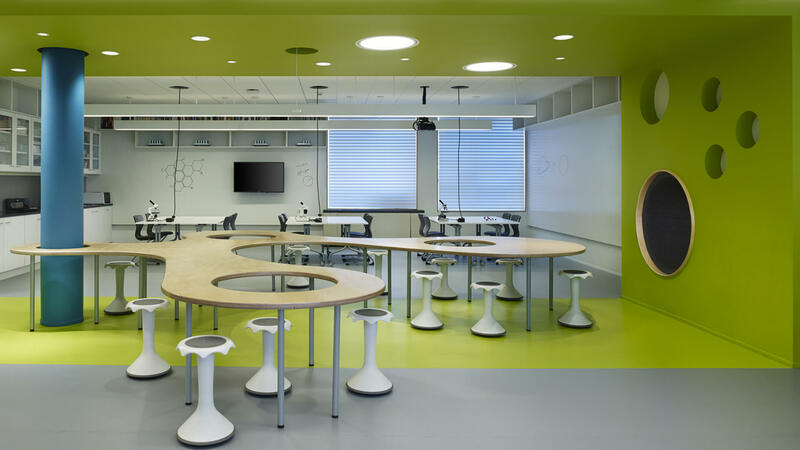 Rubber flooring and carpeting provide sound absorbing surfaces. To enhance learning options it was imperative to select furniture that maximizes flexibility. Shelving, chairs, and desks are all easily mobile for a lab that morphs into layouts most conducive for the given learning activity.